Tired of shopping too much but don’t know how to stop or slow down? Keen to become a more conscious consumer? Developed for women who shop, either a lot or quite regularly, who are interested in exploring and improving their relationship to shopping. If you wear and shop for clothing, you are qualified to participate in the mini course. An injection of ideas and information on how to look at your current clothing, closet and shopping behaviour and attitudes in a fresh light. Explore your shopping habits through a new lens that combines conscious consumption with sustainable style. For women who wish to become more conscious consumers whilst also remaining (or becoming more) stylish. We’re all about being stylish and smart. 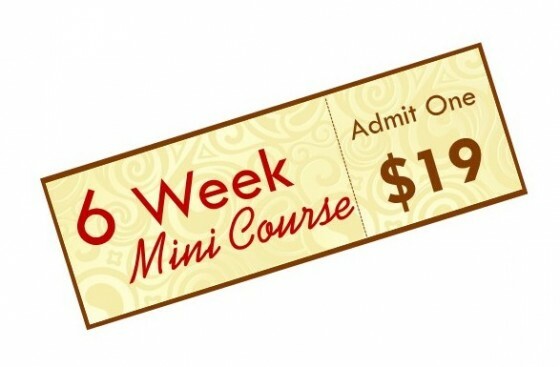 Save quite a few dollars – you may find yourself shopping less during the 6 weeks of this course, saving you from tens to hundreds (possibly even thousands) of dollars. And at the low price of $19 for the entire 6 weeks, the savings could be significant. Full of tips and techniques, ideas and inspiration for becoming a more conscious clothes shopper, you’ll be motivated to explore your closet and clothing, your shopping behaviour and values, and your shopping needs and goals with weekly activities and challenges. Delivered online at a rate of two emails per week. That’s a nice, easy pace anyone can handle. The mini course gives you new ideas and motivation to take action. You’ll feel better about the clothes shopping you choose to do. An outstanding short course delivered completely online – you can do it from anywhere in the world. Over 50 pages of content and exercises – it will get you thinking about and taking action in the direction of more conscious clothes shopping. Two email lessons a week for 6 weeks (+ media videos). 14 lessons in total, over 6 weeks. The lessons are based on and organised around the 6 aspects of conscious clothing shopping: emotional, practical, self expression, financial, organising your wardrobe, and conscious choices. Chock full of ideas and inspiration, knowledge and tools that you can use over and over again. If you’re ready to begin your journey back to conscious clothes shopping….